African American genealogy is not easy. Having an enslaved family makes it so difficult to trace your family, but I have been blessed to discover that they my family knew branches of the family back then. They kept in touch without the modern-day technology that we have today. I am more blessed to realize that my strong desire to piece my family together does not go unnoticed by those unseen visits I get when I am in the middle of figuring the relationships out. I am not alone in this research, and I am indeed grateful that I can prove it using historical documentation. This extra help, I believe, can be had by you if you so desire. How wonderful that I now could figure out who the children of my 2nd great uncle and aunt, Henry and Mary Smith. I could trace these children forward a few generations. I know my grandfather, Emory Wallace Vance, Sr. communicated with their children and grandchildren because of the letter he wrote Katharine Johnson Holland in 1972 that was given me by the Gilbert’s. In that letter, he confirmed the Henry Smith and Jane Smith Johnson McCoy were brother and sister. This is the way I know Henry Smith is my 2nd great uncle. I was only seven years old then, and he would die one year later. In addition to that, I had the rest of the interview of Rev. Ulysses Rice which he had sent me before his death. 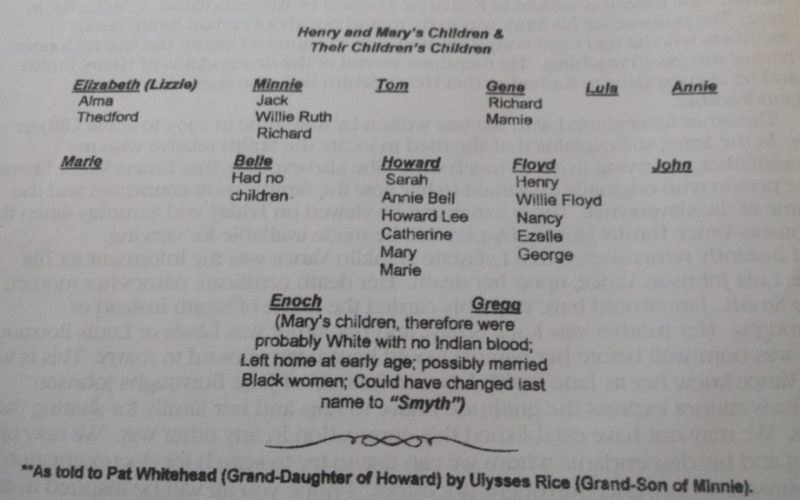 According to the transcript, Henry and Mary (from Ireland) Smith had the following children: Elizabeth, Minnie, Tom, Gene, Lula, Annie, Marie, Belle, Howard, Floyd, and John. Enoch and Gregg were two sons that Mary gave birth to outside of her union with Henry. They were white. 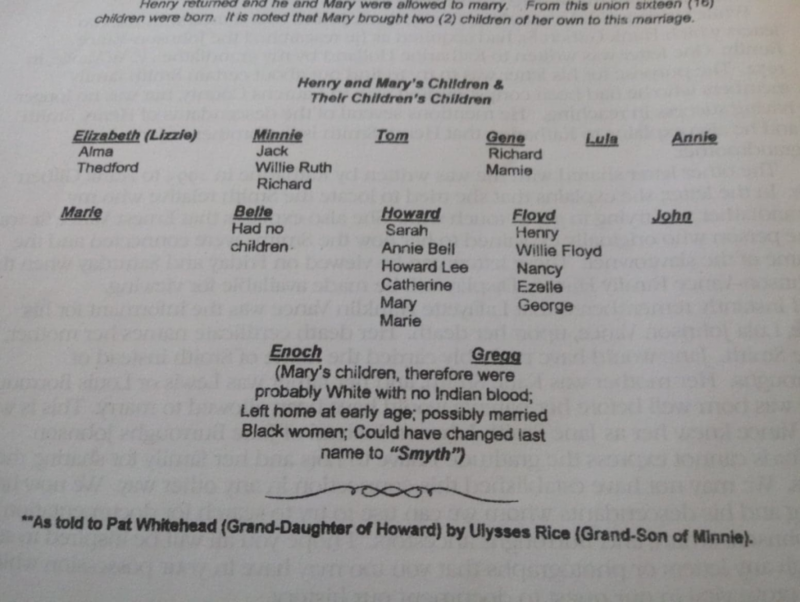 They left home at an early age, possibly married black women, and changed their name to Smyth. I decided to use the census to find the children of Henry and Mary. Remember, I already found them alone in 1870 living near Basil Smith, son of John Skinner Smith, Henry’s former enslaver. Basil is listed first, and Henry and Mary Smith (white) are listed three doors down. This would have been Henry’s first time being listed as head of his own house and free on the federal census. John Skinner Smith died before 1870, but he was still living in 1860 with Basil and the rest of the family. Basil never married. With the 1880 Census, I can start to begin to sort out birth order, and it seems Enoch Smith was the oldest at home in Waterloo, Laurens County, SC. He is listed as white, so Mary had him while she was married to Henry by another man about 1873. The rest of the children in the house are listed as mulatto: Maxie, Lula, John H., Elizabeth, Thomas, and Anna. Maxie who was listed as a son and Lula were not living with Henry and Mary 1870. Enoch was born between Lula and John H. which means Mary could have been taken advantage of somehow. Twenty years go by and different children are at home with Henry and Mary Smith in 1900 Waterloo, Laurens County, SC: Minnie S., Lillian, James, Marie, Eugeaane, Rosa B., and Howard. Henry died before 1910. 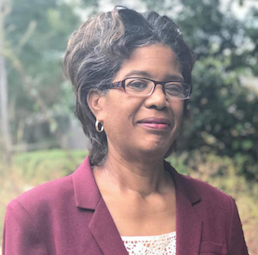 Mary is staying with Thomas and daughter-in-law, Marie, son, Eugene, Rosa Bell Henderson, and son-in-law, Tom Henderson, and son, Howard in Dials, Laurens County, SC. In looking up the censuses 1870 to 1920 where Henry and Mary Smith were listed, I was able to find Maxie, Lula, Enoch (white), John H., Elizabeth, Thomas, Anne, Minnie, Lillian, James, Marie, Eugeanne. Rosa B., and Howard. According to the 1900 Census, Mary Smith had 15 children and 12 were living. I have to look for Gregg (white) in another household. Now, I will find the children of Henry and Mary Smith with their families. These are the children that my grandfather, Emory Wallace Vance, tried to keep up with. What made it difficult was the fact that some of them migrated from Dials, Laurens County, SC to different states. Have you traced your family to the places they migrated to one and two generations after enslavement? Let us know in the Facebook Group.